Creativity is essential to life. To that end, Bookmans Speedway brings you a Simple Simon project to get your creative juices flowing. Mask making is an ancient form that spans genres and mediums, making it a perfect way to express a mood or invent a character. Are you into L.A.R.P. (Live Action Role Play), going to a fancy dress party or do need a rainy day activity for the little ones? Mask making has all the elements to make it the ideal craft. The best part is that you can utilize almost any materials to make them. Here’s an easy mask tutorial to get you started. 1. 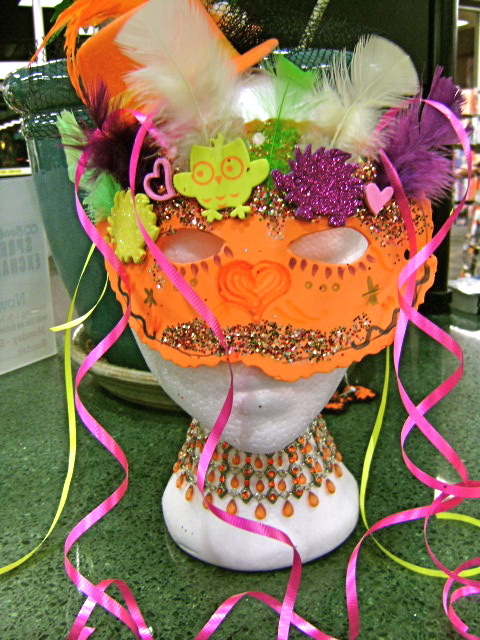 Make your own mask pattern or follow a craft store or online pattern. 2. Outline the mask pattern on colored foam sheet and cut out with pattern scissors. 3. To make the eye holes, fold the mask in half along center of eye holes and cut a half circle. Unfold the mask to make sure your peepers are properly placed. 4. Punch a hole at the far outer edge of each eye hole for the ties (to tie the mask on). 5. Tie ribbons on the each hole at outer edges and tie mask to face. * If using glitter or feathers put glue on mask then sprinkle glitter or place feathers and press firmly down. * Do not place glue on feathers, it will cause them to tear. * Extra holes can be punched around edges and ribbon threaded through. * Draw decorations on with marker or paint. Puffy and fabric paints are best and you want to avoid watercolor paints. Voila! You have created your very own one-of-a-kind mask! For a quick demonstration watch our “How To” video on Instagram or look at the step-by-step pictures on Flickr.